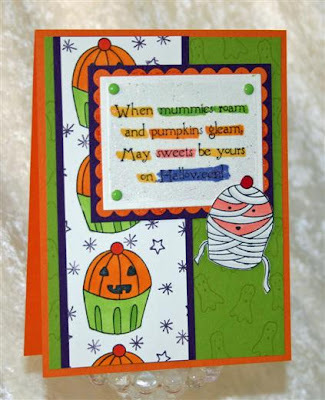 Stamp a Sweet Impression: Enter to Win SASI Sweet Treats! Enter to Win SASI Sweet Treats! TE/SASI is buzzing with excitement as we prepare to release THREE NEW STAMP SETS and a new Key Ingredients Kit next Friday! Today I have a couple of fun announcements plus a card to share with you. The first announcement is a new feature here on the SASI blog beginning on Halloween and continuing every Friday after that. It's called Our Friday Friend. Each week Taylor will scour the Taylored Expressions Company Gallery at SCS for recent uploads (within the past 10 days) in search of a SASI Stamper to be featured on this blog. Create something (card, 3D item, scrapbook page, anything) using one or more images from any SASI stamp set. Your creation should showcase SASI, but does not have to be exclusive to SASI. Upload your creation to SCS being sure to use the keyword SASI so it will appear in the Taylored Expressions Company Gallery (which is driven by a keyword search) and complete the recipe section of the upload. Super simple - pretty much just have fun stamping and upload what you make so we can see it! If you are chosen, Taylor will send you an e-mail or PM asking if you'd like to be featured and requesting permission to post one or more of your creations here as Our Friday Friend. We will include a link to your SCS Member Gallery and to your blog if you have one (note: a blog is not required to qualify for this feature.) So who will be the first Our Friday Friend? Will it be you? I have a fun Halloween card to share with you today featuring one of my very favorite costumed cuppies from Trick or Sweet - the mummy! The orange, purple, and green cardstock are all from the TE Halloween Key Ingredients pa ck, along with the green brads. The sentiment was stamped on Neenah Classic Solar White cardstock and the words were highlighted with markers before cutting and embossing the panel with rectangle Nestabilities. The entire panel was covered with Versamark ink and heat embossed with iridescent ice ep - it's super sparkly in person. I took the tiny Ghost from Frightful Night and stamped him in Versamark all over the olive panel to create a subtle background. The jack-o-lantern cuppie was stamped repeatedly on a white panel and colored with Copics. Since I had individually cut all the stars away from the house image in Frightful Night, I arranged them on an acrylic block and stamped them around the jack-o-lanterns in eggplant ink. I love having those separate little stars to play with. The mummy was stamped, colored, cut out and popped up on foam tape to make him the star of the show! Subscribe to this blog - either through the Feedblitz option in our sidebar or through your own Google reader. If you had previously done this, you can still play! 2. Leave a comment on this post and tell us you're tuned in to the SASI blog. P.S. If you haven't signed up for the Taylored Expressions Newsletter - "Taylored Treats" you can subscribe by entering your email address into the "Join Our Mailing List" in the right sidebar. You don't want to miss announcements, product focus, and special promotions! I have already subscribed to the blog through google reader and I have subscribed to the newsletter. Thanks for the chance to win and can't wait to see the new stamps sets coming out. You bet I'm tuned in!! I'm hooked!!! I can't wait to see what goes with the carolers!! I already subscribed through google reader...I didn't want to miss anything! :) I can't wait for the new sets to come out! Woohoo! I'm tuned in to this blog!! :) I love seeing what you guys cook up! I've been subscribed through Google Reader since the beginning baby!! Can't wait to see what's next!! Hoping to get my little cakes inky this weekend in fact! I am subscribed thru google!Loving the blog! Looking forward to the new stamps! Woo Hoo! I have subscribed via Google Reader. Thanks a bunch for the opportunity to win! I just subscribed-thank you for making it so easy to! I love your work and thank you so much for chance to win some fun sweet treats!! I love treats of any kind! i just subscribed! I'm a long time reader of your other blog! Thanks so much for the chance to win! I just added this blog to my Google Reader. Awesome giveaway! Love your creations...I bought one of your sets! I especially love the sketch challenges on Taylored Expressions and visit your blog regularly! I subscriber to the blog and the newsletter and I can't wait to see the new stamps. That card is adorable! I'm adding you to my reader! Too bad I won't win though since I'm not so sweet...just ask my kiddos...lol! Just found you and already subscribed. Enjoy reading your blog and yes I am tuned in to SASI. Thanks for a chance to win. I'm tuned in (via Google reader). Thanks! So glad I found this blog! ...thanks to Denise! Just found the link from Taylor's site. I subscribed and can't wait to see & read more. Taylor is great and continues to inspire, along with her design team! Just found this. Cute ideas. I'm so excited to see the new sets and what a fun Friday feature! I already subscribe and love the Friday sketches. Such fun Blog Candy - thanks for the opportunity to win! Signed Up and Tuned In...Looking forward to the new release. Hi, I just turn in refered by Sharon's blog, PaperFection. Just hopped over from Charmaine's blog - I have seen your images there before and am now signed up through feedblitz! Can't wait!!! im tuning in :) I subscribed in google reader. Thanks for having such a generous giveaway. what a fab giveaway...thanks for the chance! Already done....I have had Taylored Expressions on Feedblitz for a long time now....just added this one to google reader....can't wait to read up dates from here...thanks for the chance! I'm new to cardmaking and just found your sweet blog today. I have subscribed for updates so that I don't miss out on your blog posts. These are great items for super cardmaking! I can't wait to see who wins! How fun! What lovely goodies! Now that I know this blog is out there it's on my google reader subscriptions!!! I just subscribed. Glad I found this blog. I'm so tuned now. Hope that my luck is with me this time. I'm a subscriber!! I don't want to miss out on anything and wanted a chance at this sweet candy. I would love to be the lucky stamper to play with this sweet pile of goodies. Thanks for a chance. I just found your blog from peanutbee. I had to subscribe. thanks so much for sharing the blog candy. I just subscribed thru feedblitz ! Tuned in ...Love what I've seen so far-can't wait to see more! Thanks for this chance to win. I am tuned in to the SASI blog already!! What a great chance at some candy! Thanks! I'm tuned in - Fellow Cupcake Lover! I just subscribed.I love your blog and I'm tuned to it. Thanks for a chance to win this great giveaway! I just subscribed and I can't wait to see what you have cooked up for Friday. I just added SASI to my Google Reader. Looking forward to seeing the new releases. Thanks for the chance to win the sweet treats. I just added the SASI blog to my Google Reader. Would love to win that yummy blog candy -- thanks for the chance! Can't wait to see the new stuff. I just recently found you. I am subscribed and tuned in to the SASI blog. I look forward to the Taylored Expressions Newsletter. Hi, I have already signed up for the blog notice. I love seeing new ideas! Great blog candy too! Have a great Sunday. I'm subscribed on Bloglines. Getting ready to subscribe to the newsletter now . . . I;m tuned in and subscribed. All signed up for the blog....Can not wait for the announcement. I dont know how I have been missing this blog, but I'm all set now through the reader AND newsletter, woot! I just love all of the new stamps I have seen, and loooking forward to more! I just added you to my reader...wow! Love what I'm seeing and that's why I'm here. I didn't realize you started another blog...now I have to see what I've been missing! I am tuned in! !Can't wait to see what you have been up to!! I'm tuned in!!! Thanks for the opportunity to win. Jami, I have been a subscribed blogger for some time. I love all the ideas that is generated from this blog. And the blog candy is super. I don't own any of the stuff that is being offered. What a super sweet blog treat this would be. Thanks for the chance. I just added you to my google reader. so fun. Thanks for the chance to win! Great Blog and some really cute ideas. I'm in! Just found this blog through Stephanie Hargis' blog and I have signed up for email notices. That is sure some nice sweet treats you are offering. Thanks for the chance to win. I have your site bookmarked and love to look and see. Thanks for offering blog candy. SWEET!!! My mom just told me about this blog. Thanks for the chance to win and great ideas on your blog! Just subscribed :) I have been subscribed to Taylored Expressions forevah :) I love reading and drooling over your great creations!!! I'm subscribed with google reader. Thanks! Done and Done! So cool that there will be more things posted on this blog! Double the cupcakes, double the fun! Yep; already subscribed and I can't wait to upload my 2nd project to SCS. Thanks for the chance to win; can't wait for the new release!! You bet I am subscribed..i love seeing those uber cute stamps and keeping up to date. Liann M.
I'm tuned in to the SASI blog!! Thanks!! Wouldn't miss any TE/SASI posting!!! woohoo - I'm tuned in!! love what I see and can't wait to see the new releases!! How darling and your a peach for sharing with everyone your goodies. Absolutely tuned in. I love opening Google reader and seeing sme sweet paper treats on the SASI Blog!!! Thanks for tons of inspiration. I just found your blog and already love it. I have subscribed t othe newsletter and the blog. I think you have a fantastic site. I am looking forward to receiving your newsletters. You have give me some great inspiration today. Would love to win. I'm tuned in!! I check the SASI blog and receive the newsletter! Lookin' forward to the new releases!! I'm all signed up! Thanks for the chance to win! I just found you the other day and subscribed right away. :) Yummy sweets! I love your stamps. I have gotten so much use out of the Halloween cupcakes. I can't wait for the next release! I am definitely signed up for both the newsletter and blog updates! I can't wait to see the next release! I'm sure I'll have to have it! i'M A NEW SUBSCRIBER..REFERRED BY PAPER PERFECTIONS...LOOKING FORWARD TO THE NEW STAMPS AND YOUR BLOG ENTRIES..
Just subscribed! thanks for the chance to win! Just subscribed! Looking forward to good things!! Thanks for the chance to win blog candy! I just subscribed to the blog. Looking forward to seeing all kinds of good things here. I'm signed up. I love the projects that have been featured so far and look forward to lots more! Subscribed via feedblitz. Can't wait to see what you have in store for us. I have followed your blog for quite some time. I signed up for your newsletter and SASI blog also. Love all the ideas. Thanks for a chance to win some candy! Can't wait to see the new sets! Love what I've seen so far and waiting for the updates in my emails! I subscribe to the blog and newsletter and I absolutely LOVE them. I can't wait to see the new releases and I am loving the Halloween cupcakes. They are adorable. I am a new subscriber. Heard about your blog from Sharon Harnist. Looking forward to the new release. Thanks for the chance to win. Can't wait to see the new release! Thanks for the chance to win some yummy goodies! Subscribed! So excited to see the new release! I'm subscribed in my google reader (which is the greatest invention ever)! Thanks for the chance to win such great treat! Signed in to your blog and newsletter. Loved the Halloween kit I ordered from you - everything is so crisp and cute. I just subscribed though Google Reader; I just now figured how to do that! I have just subscribed to your fun blog, thanks to Sharon Harnis. Thank you for the opportunity to win these cool prizes!! yay, how fun, I love, love love your stuff! I'm subscribed! Crossing my fingers to win! I just subscribed. Can't wait to see the new stamps. I just discovered this blog and was happy to subscribe. It's always fun to discover informative blogs! I'm subscribed!!! Thanks for the chance to win some wonderful blog candy!! hi, I just found your blog, it's awesome! I added your blog to my Google Reader:) sweeet sweet candy! I am tuned in! What a great blog! LOVE this candy too! All of it looks yummy!! Pick me! I just subscribed through FeedBlitz. I love your blog & have been subscribed since I found it on WCMD (I think). what an awesome giveaway! thanks so much!!! I just subscribed to your Newsletter and I also have this blog on my Google REader. I am excited to see the new sets! I'm tuned in, signed up, subscribed and activated! I love this blog. Thanks for sharing the love and creativity. Just found your blog and now I'm tuned in! Thanks for the generous blog candy. Found this months ago - love it. Great cards and stamps! I love Taylor's blog and am so happy she has branched off with her new company!! Congrats..I'm here checking everyday!! I didn't realize SASI had a blog! Silly me! Well, that's been changed. I'm receiving your newsletter & signed up w/feedblitz. Can't wait to see the new release! Count me in, I just subscribed too. Love this blog. Taylor's blog is one of my favorites and I am excited about her new stamps soon to be released. I am so glad you are sharing your wonderful creations! I'm all tuned in with my Google reader. Can't wait to see what comes next! I love Jessie's cupcakes! I have been thinking about it for awhile and finally made the plunge! I just love all the cute cupcake images especialy how they are dressed up for Halloween. I can't wait to see the christmas ones! I subscribe. I'm tuned in. And having already purchased two of the three sets, I'm a user as well! Can't wait to see what's coming for Christmas! Thanks for the chance to win! Just subscribed to your blog! Can't wait to see your adorable Christmas stamps! I got here from Sharon Harnists blog, Paperfections and have signed up for your newsletter through FeedBliz. TE site is new to me so will enjoy looking around. Thanks for the chance to win. I am already a subsriber but today I also signed up for your news letter. I love, love, love Taylor's blog and I am sure I will enjoy this one too. Thanks for the chance to win some blog candy. Have a great week. TFS. I will sub now. Glad to find more fun stamps. I just signed up but have been reading since you started this blog. Love your other blog also. I'm on pins and needles waiting for your next release! Can't get enough cupcakes! I am tune in. I would love to win, the treats are awsome. I've subscribed to your blog, which I love, and I've signed up for your newsletter as well, so I'm tuned in and ready to go. Thank you so much for the chance to win such sweet blog candy. Thank you for sharing, and have a great week. I'll be subscribing right now!! Love this blog and the projects are always sweet! Thanks for the giveaway. Just found out about the new venture (I know, I know where have I been?!) Congratulations. Am subscribing to avoid this in the future! Just found this site through Taylors blog & Subscribed. Great sweet treat give away... thanks for the chance to win. Oh & PS. That Halloween card is super cute! Can't wait for the new sets - I love Christmas! I just signed up through feedblitz and your newsletter. Looking forward to what's coming up. Would love to win this sweet blog candy. Love the Halloween card too. Yep -- I'm subscribed -- I'm looking forward to the NEW stamps!! Hi Taylor~I am already signed up through Feedblitz. Love it. Thanks for the chance to win. I just subscribed! I check Taylored Expressions daily so I will definitely be back! I've been tuned in for a while and just love your creations. I can't wait to see the new stamps. Thanks for a chance to win! I have subscribed through my google reader....awesome candy. Friday's will be fun! Can't wait to see what friends you find and what they created. Loved your card at Stamp Mania, love my sweet halloweeen goblin stamp set from your store, totally love the cards you post and am happy your business seems to be going super well. I "need" that just rite stamper offering. If I don't win it, I am going to be forced to buy it! Saw Debra Ashpaugh's this weekend...total must have! Thanks for the ability to actually win something! Good luck! I'm tuned in! Thanks for the candy offer! I'm already reading thru Google Reader (LOVE ME SOME GOOGLE READER!!) and was amazed when the cuppie images from Cakespy were in the new set - my kids and I LOVE cuppie and always look for him. Thanks for offering some treats! Can't wait to see the new releases and the kits, so fun. What a fun blog! I can't wait for the new sets. How fun! I'm all subscribed and ready to go!! I am subscribed using Google Reader! I don't miss a single post. I am subscribed, and love all the fun new stuff. Keep it coming, you have me hooked! I am a Feed girl and I love looking at all the new stuff and samples! Thanks! I'm a new subscriber to both the feed and the newsletter. Awesome "candy"! I am definitely tuned in, both as a newsletter subscriber and now also a blog subscriber. I love the SASI stamp sets I already have and can't wait for the new ones! I just discovered these wonderful stamps and this great blog. I will be a definite regular now that I've subscribed. I just love Frightful Night.Thanks for the chance to win. Taylor, you make it so hard to 'be good'! LOL I love the cards and stamps...and the blog candy is toooo much! I'm am going to look at stamps -- I may have to cave! I just signed up for your newsletter, thanks to Jami for letting me know about it. I would love to win the blog candy. I adore the Halloween card, real cute and colorful. Oh Yah Taylor...I already subscribed and I'm so tuned in. I have two of your cupcake sets to play with now and the cool stamp binder...I can't wait to see the new sets. I love cupcakes. I am so happy for you. I wish you all the best Taylor. I just signed up for the blog updates! What yummie treats! What fun one could have with all those goodies! Thank you for the chance. I just signed up for this blog and I am already getting the newsletter. Can't wait to see the new stamps! You are on my google reader and I have signed up for the newsletter. I am looking forward to seeing the new stamps. I've always enjoyed your Cupcake Fridays...so now I'm signed up for all the sweet treats you're bringing to us! Thanks for sharing! what fun ideas you have here! I signed up for the newsletter and this blog. I don't know how I missed it before as I am a subscriber to your TE blog. Already subscribed but can't wait to see the new releases. TFS! I'm tuned in! I signed up for the newsletter and you are also in my google reader. Looking forward to seeting the new sets. I'm all signed up too! I love the little mummy cupcake. He's just adorable! I love your blog...congrats on your new venture. Looking forward to seeing more of your adorable stamps! I am signed up!!! I love these cupcakes! I'm signed up and tuned in! Excited to see the new releases. This is the first time at this blog, but it won't be my last! Thanks for sharing your talent!! I just found this blog!! It's great! Even without the prize candy, you have my subscription! So much to see on here! Thanks for sharing! I am tuned in thanks to Taylor and her blog! Glad I finally got on this "channel!" Can't wait to see the new releases. I have be hooked up with taylors Blog for a while... I look forward to all your new posts/ideas... thanks for the chance to win. Already a subscriber, thanks so much!!! I am super excited to see the new stamps!!! Can't hardly wait!! Just subscribed :) Looking forward to your new stamps. I subscribed cant wait to see the new stamps. I registered. Good to have another source for inspiration. I already subscribe to Taylor's Blog, but just subscribed to this one. Looking forward to seeing all the new posts. I have subscribed and ready to go! I can't wait to see your new stamps! I'm in!!! I cannot wait to see everything! Just subscribed, thanks for the chance!